Since we are quite fond of beer, let’s take a look at the sort of non-partisan shenanigans our Hill Staff get into when they make their own beers. 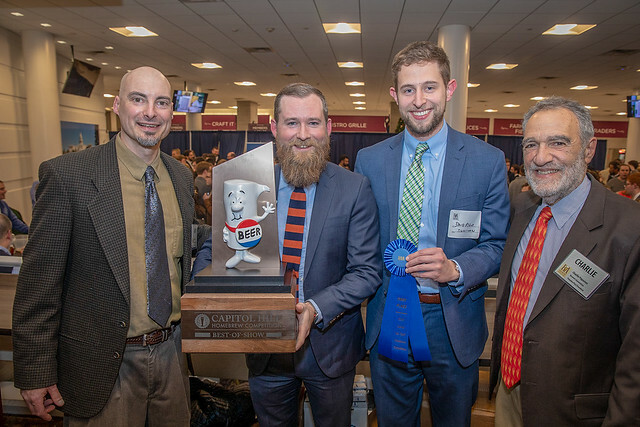 On December 11th, the American Homebrewers Association (AHA) hosted the 3rd annual Hill Staff Homebrew Competition at the Longworth House Office Building. The most non-partisan event our House and Senate take part in. Because everyone loves beer! Besides the brief award ceremony (see list of winners below), the event proved to be a mini-beer festival with at least 16 different breweries pouring two different beer styles, with lots of stouts and IPAs available. Locally represented was Port City, Denizens and Heavy Seas. While there were plenty of other regions represented, three came from the Pacific Northwest – Fremont, Reuben’s Brews and Dechutes. One could also get a quick taste of some of the competition’s homebrew entries, and I was able to try the 3rd place finisher (Sweet Stout) in the Spiced and Wood Category. I liked it. Also, the House vs. Senate Best on the Hill Homebrew Award went to the Senate this year for its Oatmeal Stout. (These two beers were made during the Homebrew on the Hill event back in September and awarded by popular vote at the reception.) I tried them both and cast my vote for the House’s sour beer (but both were pretty good). Charlie Papazian, retiring founder of the AHA (after 40 years! ), gave a few words to the milling and happily beer tasting crowd, then announced the winners. 1st place entry from each category competes for the overall trophy.